high risk, high cost, and all-consuming project with uncertain results. However a well-planned rebrand strategy can be a strategic business decision resulting in good returns. Successful rebrand projects all have one thing in common; excellent planning. Get this step right and you’re in a good position for implementing a successful and stress-free rebrand project for your business. 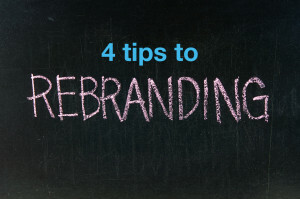 Here’s four tips to consider when undertaking a rebranding project. Know who you are and why you matter. The purpose of rebranding is simple: to keep your brand in the customers’ mind, reach new customers, and have a point of difference from competitors, new or old. Successful rebrands focus on the long-term plan and asks the right questions; how do we want our brand to be perceived by our customers? Who do we want to appeal to? Understanding your business, its market positioning, and how your service offering is different or better than competitors will serve as a guide to developing an accurate rebranding strategy. Commit to the rebrand and keep it moving. A rebrand begins with the announcement of a rebrand. The excitement is contagious, and it will carry over into all sorts of new projects and endeavours. So once you declare a rebrand and get the momentum going, don’t stop. You don’t have to act fast, but you do have to keep producing results. Rebranding is work. Once you’ve rebranded, don’t leave any of your old, less-awesome branding lurking around to confuse people. While planning a rebrand put a checklist together of everything that needs to be changed; you’d be surprised what needs to be changed. For a checklist of items to change please download your free e-guide to rebranding success. Rebranding is more than a logo, it’s the company’s demeanour and how it’s perceived in the marketplace. Take the opportunity to change things up. For example freshen up the office, explore new marketing channels such as a website development, or open social media accounts. Whatever you choose do something both strategic and new. A rebrand is the perfect opportunity for making a ‘splash’ in the marketplace by launching the new brand through various marketing channels. Rebranding doesn’t need to be arduous and, if planned well, won’t be! Instead look at it as an opportunity for business repositioning in a busy marketplace. Visit our website for a free e-doc on “Guidelines to Get Your Rebrand Right”.